Nothing can take the wind out of your sails and make one reassess current strategies quite like an unexpected and critical loss of funding, which is what happened to 24 major arts organizations in our nation's capital two weeks ago. Shortly after the federal government averted a shut down, it was revealed that a part of the budget compromise was 74% reduction in the allocation to the National Capital Arts and Cultural Affairs Program. Many do not realize that the District of Columbia is a federal territory under the complete authority of Congress, and as it is not a state, it does not receive voting representation in either the House of Representatives or the Senate. However, DC residents pay some of the highest federal taxes in the nation and their city's budget is established by Congress, leading to a cry of "taxation without representation." At a moment when Congressional representatives were trying to make substantial cuts to the nation's budget without affecting their districts, the District of Columbia became an easy target, the results of which saw a relatively reasonable and proportionate cut of 7.5% to the National Endowment for the Arts and a crippling, disproportionate cut to the National Capital Arts and Cultural Affairs Program. As a marketing professional working for one of the affected institutions in the District of Columbia, it caused me to think about how marketers view their role, and how a marketer could respond, keeping in mind that John Kennedy reminded us all that there are always moments of opportunity in crisis. I came to the conclusion that marketing professionals are going to need to reexamine traditional beliefs about our job responsibilities. Last weekend, I was listening to Ric Edelman's radio show on WMAL as I was driving. Ric is a very well known local financial advisor, and he sits on the board of Wolf Trap National Park for the Performing Arts. He took about ten minutes to discuss an upcoming proposed Congressional funding cut to Wolf Trap's STEM program, where he described an e-mail he received as a board member asking him to contact Congress to voice his objection to the cut. He shared with his listening audience that he decided not to contact his congressional representative, because he thought given the economic crisis Congress was facing, that he couldn't in good conscious ask them to protect the arts. In defense of Mr. Edelman, he did go on to say that he would increase his personal contribution to Wolf Trap, and then asked his audience to give as well. However, it made me think that here is a very intelligent man who is prone to supporting the arts and who makes his living off of maximizing return on investment for his clients, but he doesn't understand that arts funding fuels the economy and provides one of the best returns on investment of any public funding avenue. In 2007, Americans for the Arts released Arts and Economic Prosperity III, the most comprehensive study of the economic impact of the arts and culture sector. It revealed that the arts industry is responsible for $166 billion in economic activity, almost $30 billion in tax revenue and 5.7 million full time jobs. So why is a financial advisor advocating cutting an investment that has such high returns on investment? My answer -- arts marketing professionals aren't doing enough to educate their boards and audiences. If Mr. Edelman had all the facts, I am sure he would view the arts as a solution to the problem, not a burden on the system. Among arts professionals, there is a very familiar story often told about Sir Winston Churchill's time as Prime Minister of Great Britain. As the story goes, during the height of the second world war, Churchill's finance minister recommended cutting the arts to help support the war effort. Churchill responded with "then what are we fighting for?" Obviously, Mr. Churchill viewed the arts as vital to the daily lives of his constituents. Can the same be said for us? I would argue not. In the past, the arts organized communities. Today, in many of our nation's preeminent arts organizations, they only organize the wealthy and the elderly. 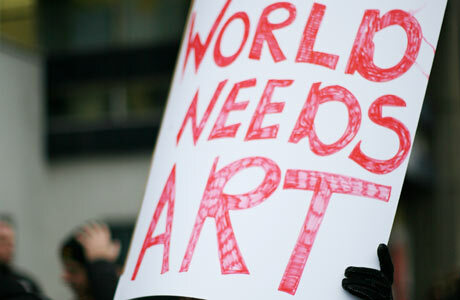 As such, it is easy to see why some view the arts as frivolous. Arts organizations should be community centers, and marketers should work to constantly lay out the welcome mat to every member of their community, rich or poor, young or old. As government funding revenues dry up, we have before us even a greater challenge, as many arts organizations look to earned revenue sources (i.e. ticket sales) to make up for lost ground, but in doing so, could be sacrificing accessibility, ensuring that only a slight portion of their community is able to be served. I must commend organizations like Signature Theatre Company in New York, which leveraged a major philanthropic gift to provide $20 tickets to all seats for all performances. They boast sold out houses for every performance, and serve a maximum number of people in their community as ticket price is no longer a barrier. As marketing professionals, in a time where there is more and more pressure on earned revenue, we must work to make sure our organizations are community centers and accessible to all. I started out my career as a public school teacher. I went to college and received a Bachelor of Science in speech and theater education from Missouri State University. Soon after graduating, I decided to go to graduate school for producing, partially because I saw my peers struggling to find teaching jobs as arts education positions were being eliminated statewide. Today, many states have eliminated the arts in their curriculum entirely, as funding has become closely linked to performance on student achievement exams set forth by No Child Left Behind. As a nation, we are in our second decade in which a majority of public school students will have received no formal arts education. Soon, arts marketing professionals will face situations in which we will become responsible for educating prospective patrons on artistic offerings as even the most famous of artists will be unknown to a large portion of young adults. The time in which a marketer could reasonably expect the general population to know who major artists is coming to an end. We will become the front line educators. I am continually amazed at the number of large arts organizations that function with marketing and development departments operating as silos. In some instances, the two departments have their own graphic designers, printers, mail houses, event planners and the like. When budgets are tightened, arts administrators must do everything in their power to get the best possible return on each dollar spent. All to often, the artistic product suffers because of the inefficiency of management. Combine resources and as a team, look for ways to reduce expenditures and maximize return. Make judgments together on where resources should be allocated, and eliminate redundancy. Marketers have to reassess their metrics of success. No longer is it good enough to make a sale. We must strive with each and every transaction to secure a sale and a donation. I challenge marketers to view themselves as having as much responsibility for hitting contributed revenue targets as they have with earned revenue targets. Only then will we be looking for the highest return on each dollar spent and on each transaction achieved. 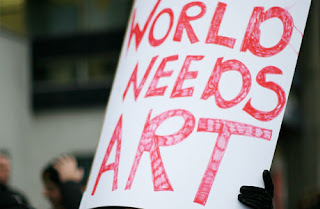 I would like to conclude this post by alerting readers to an excellent blog post entitled "The Top 10 Reasons to Support the Arts" written by Randy Cohen, Vice President of Research and Policy at Americans for the Arts. For those interested in up to the date information on all issues facing the arts, the Americans for the Arts website is an excellent resource.